Snoop Dogg is making his theatrical stage debut as an actor in the musical "Redemption of a Dogg," co-starring Tamar Braxton as his love interest. They are taking the musical on a U.S. tour, which begins Oct. 5 in Houston and ends Nov. 11 in Washington, D.C.
"Redemption of a Dogg" is written, directed and produced by Je’Caryous Johnson. 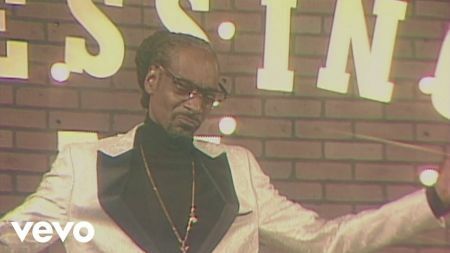 Snoop Dogg plays a character loosely based on himself, which is described in a press release as "a multi-faceted character who is a gangsta rapper, family man and man of God." The musical, which will feature Snoop Dogg's songs from rap to gospel, "examines the internal battle one man has between preserving his life-long legacy and losing the love of his life when he is faced with choosing fame and fortune over faith and family," according to the press release. Tickets for the show can be purchased here. Oct. 5 – Houston, TX – Hobby Center, 8 p.m.
Oct. 6 – Houston, TX – Hobby Center, 3 p.m.
Oct. 6 – Houston, TX – Hobby Center, 8 p.m.
Oct. 7 – Houston, TX – Hobby Center, 3 p.m.
Oct. 7 – Houston, TX – Hobby Center, 7:30 p.m.
Oct. 14 – Brooklyn, NY – Kings Theatre, 3 p.m.
Oct. 14 – Brooklyn, NY – Kings Theatre, 7:30 p.m.
Oct. 20 – Chicago, IL – Arie Crown Theater, 3 p.m.
Oct. 20 – Chicago, IL – Arie Crown Theater, 8 p.m.
Oct. 27 – Detroit, MI – Music Hall Center, 3 p.m.
Oct. 27 – Detroit, MI – Music Hall Center, 8 p.m.
Nov. 10 – Washington, D.C. – Warner Theater, 3 p.m.
Nov. 10 – Washington, D.C. – Warner Theater, 8 p.m.
Nov. 11 – Washington, D.C. – Warner Theater, 3 p.m.
Nov. 11 – Washington, D.C. – Warner Theater, 7 p.m.